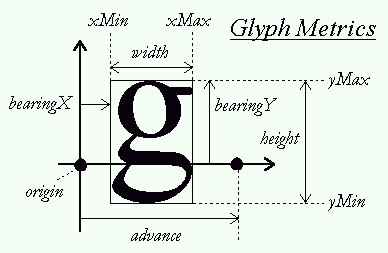 The loaded font to get the glyph metric from. The character to get the metrics from. The left side of the glyph. The right side of the glyph. The bottom of the glyph. The top of the glyph. The amount to advance the pen forward after drawing (ie the width of the glyph with spacing on both sides). Gets the glyph metrics from the font file. NOTE: This image may help understand the different metrics.